This device is a perfect choice for home. It has printer, copier and scanner in one unit. It is a rather compact printer, which has wide range of functions and rather low cost. Epson Expression Home XP-102 is a representative of compact devices series, which has all the necessary functions in one small case. This printer is the smallest device for home, which has been ever created by Epson. As the previous model Epson Expression Home XP-202, the cartridge of Inkjet printer Epson XP-102 has separate reservoirs. So, you can replace just the container, which ran out of ink, but not the whole cartridge. Due to this, you will be able to save your money. Epson Claria ink will perfectly fit this printer. This ink will provide clear and legible printing and the quality of photos could be compared with lab photos. At first sight, the design and set of functions of this multifunctional device have remained without changes. As a matter of fact, the changes are not visible from outside. It is still a compact device of Epson MFP series, which combines printer, scanner and copier in one unit. But if you look inside, you will see the changes. The technical specifications were improved. Also it differs from old-style printing devices, such as Stylus DX and SX. Epson XP 102 has innovations despite of the similarity with predecessors. The size of the printer is just 390mm x 300mm x 145mm. 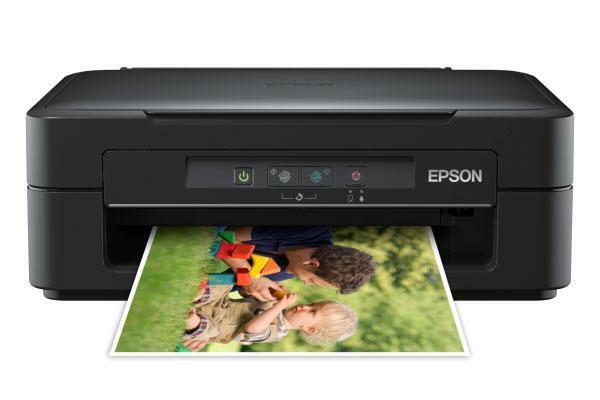 The dimensions are similar to Epson XP-205, so XP-102 Epson can be located at any place of the house. Thus, even if you are lack of free space, the printer will not disturb you. The original printing head of Epson XP-102 was design with accordance to the latest technologies. So, it will provide users with qualitative prints. The printing resolution is 5760 x 1440 dots per inch. The printer works rather fast and noiselessly. The paper tray can hold up to 50 sheets of A4 format. Epson XP-102 can use different mediums for printing, such as envelopes and glossy photo paper. The resolution of the flat-bed scanner is 600 x 1200 dots per inch. A lot of users from New York, Washington, Boston, Detroit, Chicago could appraise the functionality and efficiency of Epson Expression Home XP-102. The printer was meant for students and for home use, so Epson Company offered a reliable multifunction device with wide rage of functions at a reasonable price. This printer is not supposed to be connected to any computer. Epson XP-102 can print from any compatible device such as camera and tablet computer via special cable. Also, you can use Memory card slot. The availability of direct printing allows XP-102 Epson to work without PC.